Contest Alert! 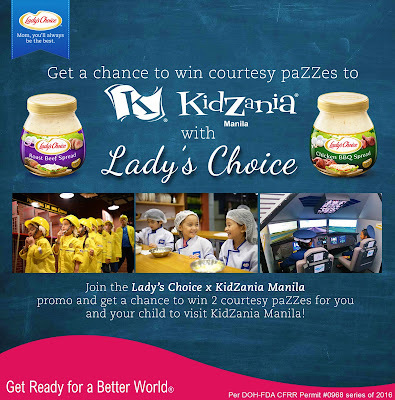 Win PaZZes to KidZania Manila with Lady's Choice! Have you tried the new Lady's Choice newest spreads: Chicken BBQ and Roast Beef yet?My family love the new variants and we each have our own pick. You can read my simple sandwich recipes and a quick review of the Chicken BBQ and Roast Beef spreads on my earlier post here! If you haven't tried, it's about time you do because Lady's Choice is treating to you and your child to a day at KidZania Manila! For the mechanics, just follow the steps below or check the full mechanics at http://www.ladyschoice.com.ph/articles/view/get-a-chance-to-win-courtesy-pazzes-to-kidzania-manila.